Chris Hoctel and his aunt, Kathy Goodpaster, are hoping to raise the funds needed to transport him to Dayton before Cottage closes its subacute care facility. 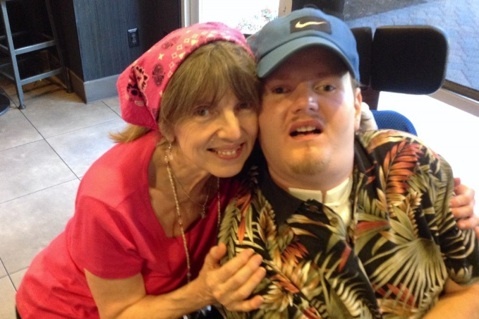 Kathy Goodpaster may be betting on miracles, but right now she’s praying that her social media fundraising campaign — via GoFundMe.com — will generate the $20,000 needed to transport her severely brain damaged nephew Christopher Hoctel back to Dayton, Ohio. Thus far, she’s raised $3,500, and her nephew only has a few months left before he has to vacate the subacute care unit at Goleta Valley Cottage Hospital. The 32-year-old Hoctel has been a patient at Goleta Valley for the past six years, when a heart attack laid him low and cut off the oxygen his brain needed. Like the rest of the unit’s 25 long-term patients, Hoctel must find new digs before Cottage’s subacute facility is shut down for good in the next few weeks. Most of the patients — who need respirators and feeding tubes to stay alive — will be transported to Camarillo’s St. John’s Pleasant Valley Hospital. But some patients’ families — overwhelmed by the much longer drive required to St. John’s — have opted to bring their loved ones home. In Hoctel’s case, his aunt, his mother, and his grandmother are actively conspiring to get him back to Ohio, where the family originally comes from. Not only that, Goodpaster said, the Ohio State University hospital boasts some of the best brain trauma care in the country. “In Ohio, you can get sick or shop,” laughed Goodpaster. The problem is getting there. The price tag to airlift a patient requiring Hoctel’s level of intensive care from Santa Barbara to Ohio is $20,000. Insurance only covers the cost of relocating to nearby facilities not cross-country. Goodpaster was hoping Cottage might kick in a portion of the cost, but discussions with the unit social worker, she said, have not been fruitful. Since Hoctel checked into the Goleta Valley subacute unit, Goodpaster said, medical science has achieved a greater appreciation of the brain’s regenerative abilities. And working hard to jumpstart Hoctel’s neuron paths have been Hoctel’s mother, Lori, Goodpaster, and Goodpaster’s mother. (Hoctel and his mother moved to Santa Barbara when he was an infant. His parents divorced before he was one, and his mother — who is now fighting cancer — is retired.) Over the past four years, the three women have tag-teamed personal care for Hocte — who was preparing to start a business as a wedding DJ when he suffered the heart attack — reading to him, talking, and giving him massages. When Cottage announced two years ago it was shutting down its subacute care facility, there was a howl from some family members. On a good day, the additional drive time to and from the new facility in Camarillo would add at least 90 minutes to their trip. This would discourage the sort of focused family involvement that in Hoctel’s case has defied therapeutic calibration. Cottage Health System — which owns Goleta’s hospital — is now engaged in an extensive seismic retrofit and remodel of the Goleta facility. Initially, the plan was to relocate subacute patients onto Cottage Hospital’s fourth floor, but hospital administrators concluded the fourth floor lacked the easy in-and-out access Goleta provided. For family members seeking to transport their loved one in and out in wheelchairs, they said, the logistics would be daunting. Once outside, they added, there was no place really to go that wasn’t crowded and congested. Cottage approached St. John’s in Camarillo instead. A few years ago, St. John’s — which maintains the only hospital-attached subacute facility in Ventura County — was about to shut down its subacute floor due to seismic issues. Cottage offered St. John’s $3 million to keep its unit open, and in late 2013, the deal was announced. Sometime in the next two weeks, that deal will be consummated, meaning all patients have to be relocated. To make that happen for Hoctel, Goodpaster is seeking donations via gofundme.com/pzebec.